Tickets go up to $35 on November 2nd - December 15. Tickets at the door $40. Get your $30 tickets now! ~ MAKE CHECK PAYABLE "RUSTY FRANK"
Call Rusty, 310 606 5606, and buy your ticket with a VISA or Mastercard. 1. WHEN SHOULD I ORDER MY TICKET(S)? 2. HOW DO I PICK UP MY TICKET(S)? 3. WHERE IS THE DANCE LOCATED? 4. IS THERE NEARBY PARKING? 5. WHEN DO DOORS OPEN? 6. WHAT IS THE EVENING'S PROGRAM? 9. HOW MUCH ARE TICKETS AT THE DOOR? 10. WILL THERE BY FOOD AND DRINK THERE? 11. WHERE CAN I FIND OUT MORE ABOUT LADD MCINTOSH? WHEN SHOULD I ORDER MY TICKET(S)? We are restricted to 250 tickets, so this event is sure to sell out. 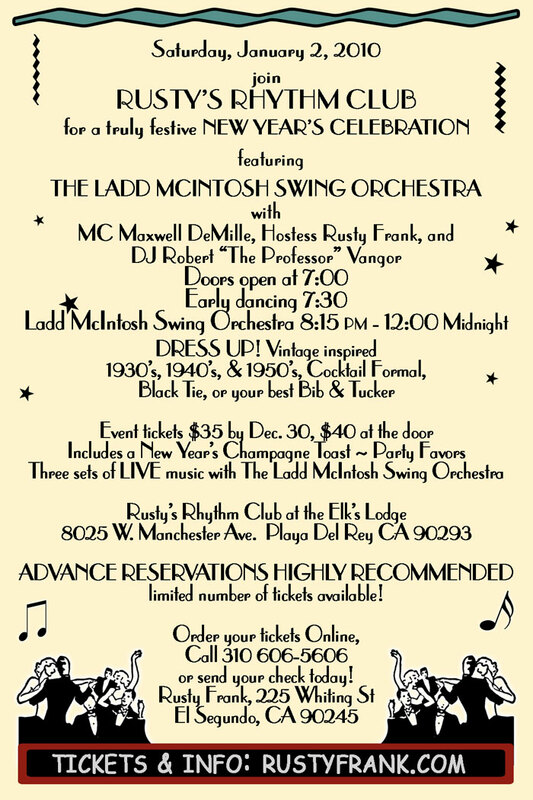 Get your tickets early, and know that you won't be left out in beginning your New Year right. There is plenty of FREE parking. Park and enter at the back of the building. The doors will open at 7:30pm. WHAT IS THE EVENING'S PROGRAM? 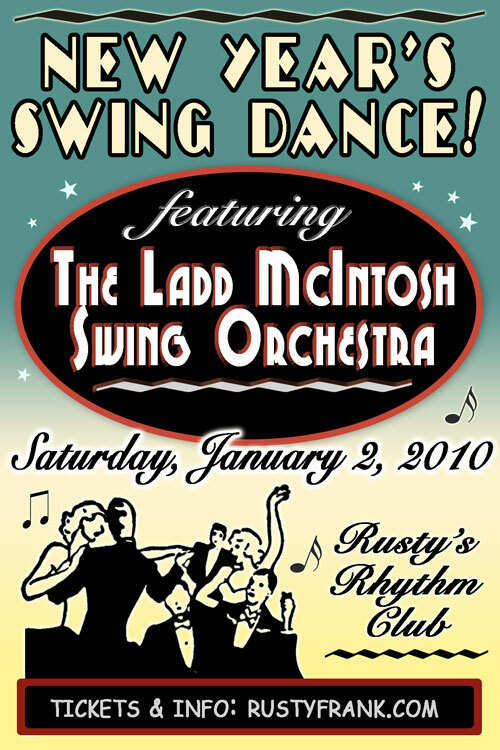 8:30 pm The Ladd McIntosh Swing Orchestra! DRESS UP! Think of this as a New Year's Eve party not on New Years. Go for it. Dress in vintage inspired 1930's, 1940's, 1950's, Cocktail formal, Black Tie, or your best "Bib & Tucker." Tickets at the door will be $40. There is a full cash bar. Make sure to eat before you get there (or a late supper after?). WHERE CAN IF FIND OUT MORE ABOUT LADD MCINTOSH?